Make bite heaven in your lips. Here's a secret recipe of our wicked Bellychon. Make sure the chilled cans of beer are ready. This is one yummy pulutan! 2. Place the belly pork skin side down on a board. 4. Sprinkle with the grated Parmesan cheese. 5. Add salt and black pepper to taste. 7. Starting from one end, roll the pork up firmly. Tie a string around at 1 inch intervals to secure the roll. 8. 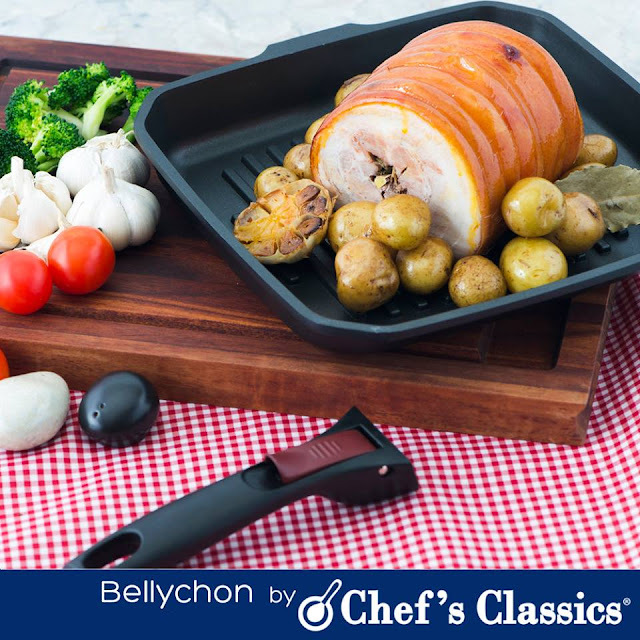 Transfer the rolled pork on to the Chefs' Classics Caper Detachable Grill Pan. 9. Roast until cooked through for about 2 hours. 10. Place the pork on a board, and leave to rest for about 10 minutes. 12. Carve into slices, and arrange on a plate. Dig in!